Bluetooth beacon provider Sensoro has linked together the 110,000 Bluetooth Low Energy (BLE) beacons it has deployed across China to create a single platform that marketers can use to send highly targeted offers to shoppers. Among the locations equipped with beacons are 25 movie theatres, 16 airports, 39 retail stores, 40 tourist destinations, 200 universities, 260 high speed trains, 1,500 Pizza Hut restaurants and 2,100 Chow Tai Fook (CTF) jewellery stores, Sensoro says. 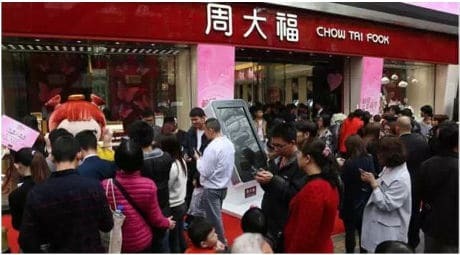 “During the 2015 Chinese New Year, Chow Tai Fook’s use of iBeacon brought in 11 million dollars in revenue with a conversion rate up to 63%, far surpassing expectations,” Sensoro adds. “The success of the case persuaded CTF to deploy beacons in all 2,100 of their Mainland China retail stores. Sensoro launched a joint venture with Chinese chain store operator Cyber Group to roll out BLE beacons across Japan and the Greater China region in August 2015. Beacon technology is bound to transform the traditional marketing at brick and motor store. Stores should be early adopters to have significant gains and domain knowledge of this technology. We folks at Mindbowser are pretty excited to try out new things with BLE Beacons. Reach Out to us if you share the same passion or want to build a solution for yourself. If I am interested, what do you suggest?